Mobile | OptionsRoute - Low Cost Options Trading. Available on iPhone/Android/Web. Accessible Everywhere. Trade from Anywhere. Enter Trades in your OptionsRoute Brokerage Account with iPhone, Android, and Web Apps. Touch a Price or Chart and Quickly Enter Orders for Stocks, Options, and Options Spreads. WebTrader Mobile provides real-time streaming quotes and news to make informed investment decisions fast, anywhere, anytime.Use a number of default watch lists or create custom quote lists as 1-2-3. Book mark favorite quotes, pick the data and columns to be displayed, select the color theme and display type. Get access to the most important information faster with WebTrader Mobile. Identify emerging market patterns, explore new trading opportunities with real-time streaming customizable charts and trade from charts to seize the opportunity right away. Each of 4 chart types (candlestick, bar, line, area) is viewable through multiple time intervals. The charting functions are intuitively zooming in and out. Pinch, tap charts, and tilt your mobile devices to expand charts into horizontal full view mode. Set up and manage price alerts from your mobile device. Create alerts from the watchlist or a dedicated 'price alerts' tab in the menu panel. Traders pick from a variety of conditions and control risks no matter how far away they are from a trading desk. 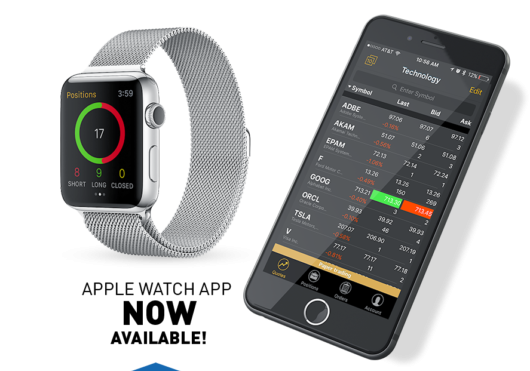 Enable your device not to miss any trading opportunity and to quickly react to market changes. 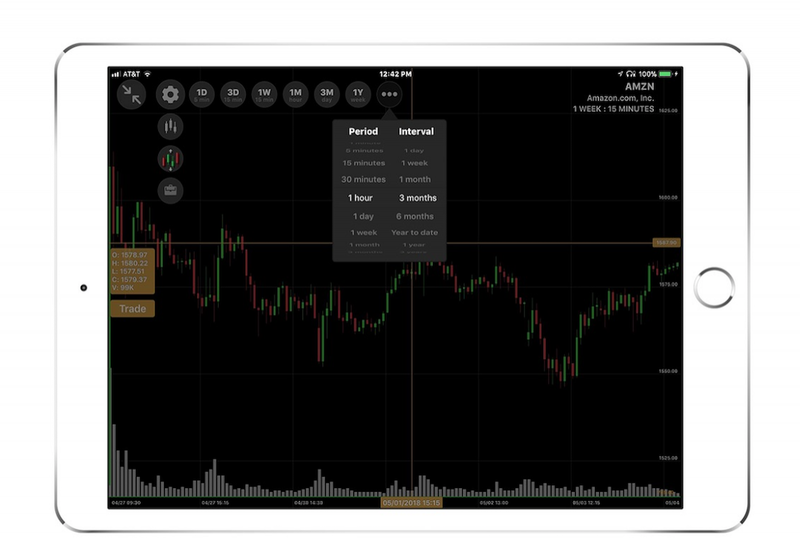 Alerts in mobile trading platform sync with the web trading platform in real time. Options Trading is enabled in on the Mobile Trading Platform. 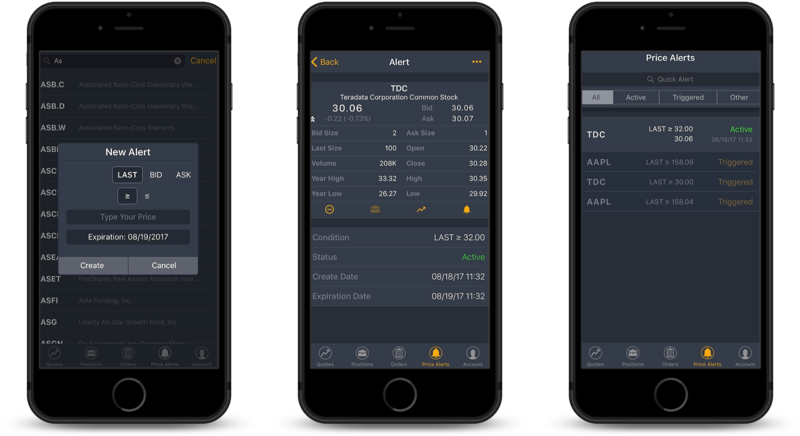 Options Traders can access information on options chains, place or modify orders, including multi-legs and create alerts right from their mobile device. Option ticket is available from the Trade Screen with a wide range of parameters and settings. Stay informed and in control of your trading accounts even when away from the office or desktop computer. Information is the key for successful investing. Monitor your portfolio on the go with Live Account Balances and a wide array of settings. View and manage account data from any location and at any time. For over a decade the software developer has consistently delivered superior trading software and have earned numerous high profile awards and recognition, including receiving the #2 rank in usability by The Wall Street Journal Barron’s Magazine. The software has consistently scored 4 stars at the Annual Barrons' Best Online Brokers Review.